A lilac helmet, topped by a red crest. Fountains of snow and an outfit in garish green and yellow. 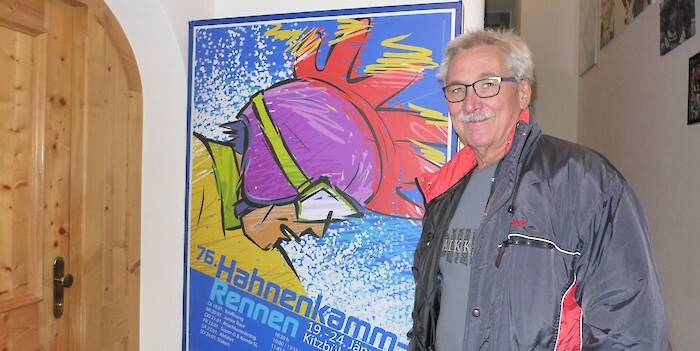 The poster for the 76th Hahnenkamm Races is a testimony to dynamics and speed. „The strong colours of red and yellow are in direct contrast with the cooler colours, and flames of enthusiasm blaze at the finish line“, explains the artist, Hans Kalian. The jury headed by K.S.C. President, Michael Huber, have taken an entirely new direction by selecting this poster design by the artist from Upper Austria. The fact that Hans Kalian is a master of his trade becomes very clear when you look back on his professional career. After attending the HTL Technical College for Graphic Design in Linz/Donau, Kalian began to turn his passion into his profession and studied in Vienna at the Higher Federal Teaching and Research Institute for Graphic Design. He has been a freelance artist, graphic designer, author and illustrator since 1977. Thanks to his diversity and creativity, he has already achieved success at several invitations to tender. Kalian founded his own publishing house in 2004, with a focus on literature for children and young adults. He has created, amongst others, “Die Lindwurmsage – the Dragon Legend”, as well as many school textbooks. Since the inception of the poster design competition, proceeds have been donated to promote young ski talent. Last year's revenue was a record result, "I would like to take this opportunity to thank all those who purchase, as well as all those who sell, the poster", thanked Huber. The Hahnenkamm poster costs Euro 15.